Picked clients up a 7am at HighPoint and ran to a 10'flat and put out 10 Planner Boards and a Bobber. We put out both Gizzards and Herring and before I could get all of them out the fish started nailing the baits. 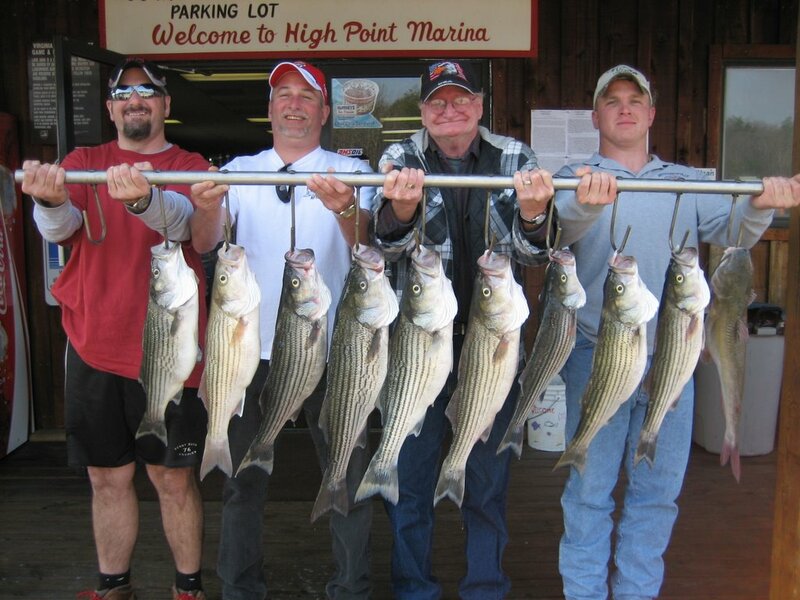 Our first fish was a nice Striper but it got caught up in another line and broke off right at the boat. Before I could bait up other boards started going off and in the first hour we had 11 hits. We had a couple of small fronts blow through today and the fish would feed prior to the fronts for a few minutes then shut down. We continued to work 10 foot flats all day and ended up getting 26 hits. One client today had trouble with touching the line every time he picked up the rod when a fish was on and lost at least 5 nice Stripers himself [Bruce, I won't mention your name]. Anyway, they all had fun and caught 16 Stripers and a Catfish. This was one of the first days the wind did not howl all day and allowed us to fish where we wanted to.